Water sandals are the most popular type of water footwear sold today. And for good reason. For most uses, water sandals are ideal types of footwear for water sports activities. Before going on, though, let's talk about what a water sandal is not. A water sandal is not a flip-flop. Nor is it a cheap Wal-Mart sandal bought for the local beach or the gym shower. It also isn't one of those nice leather sandals that people wear around town, out to dinner and occasionally to the office. Instead, a true water sandal is a specialized sandal that is desgined to provide super traction on the wet and slick surfaces found along and in a river or lake. In general, a quality water sandal has traction similar to what is found on hiking shoe. This traction is what allows people to go in and out of the water without too much fear of taking an unexpected fall into a chilly Montana river. Also note that several types of "water shoes" are actually called "water sandals." It is easy to tell a water sandal apart from a water shoe, however. Water shoes have a "closed-toe," similar to an athletic shoe. Water sandals lack this closed toe. Outside of Montana, water sandals are probably the most popular footwear type for playing and being around water. And the reason is obvious. Water sandals are quite affordable and work well for a wide variety of situations that don't involve hiking, scrambling across rocks or heading out to a $500 a plate dinner. Still, water sandals due have their specific uses, so below are people that might especially want a water sandal for their watersport activities. Swimming – Kind of obvious, but water sandals are perfect for protecting the soles of the feet while swimming. Just be sure to get a sandal that won't quickly fall apart due to being taken in/out of the water. Summer Floating - During warmer weather, and where I know I won't be doing any major hiking, water sandals are my footwear of choice. They are light, easy to get on/off and provide all the foot protection I need during warmer weather. During cold weather, however, a water shoe is preferable, since a water shoe holds the neoprene bootie tighter against the skin. Around Town - Water sandals, while they may not look as nice as a fancy leather sandal, still work just fine around town. I wore my Teva's for sixty days in Thailand without any issues (well, other than a mis-step that causes a broken toenail). The superb traction of the sandals worked fine in all sorts of conditions, from wet pavement to sandy beaches and just about everything else in-between. Wade Fishing - No water sandal or boot comes closes to traction and safety when compared to a dedicated fly fishing wading boot. However, that said, a good quality water sandal (such as those made by Keen and Teva) do provide very good traction in the water. As such, water sandals can make for a "poor man's" wading boot provided they are used in very slow moving waters and the river bottom isn't littered with large rocks. That said, a water shoe makes a much better "poor man's" wading boot than a sandal, due to the superior foot protection and the shoe's ability to keep out rocks and sand. Trail Hiking or Rock Scrambling – Sandals, even good ones with solid traction like Teva's and Keen's, simply can't compare to the support a water shoe provides. As such, hiking in a water sandal, especially on rocky or uneven terrain, is a wonderful recipe for sprained or broken ankles. Long Distance Hiking - Hiking for a dozen miles, even in simple terrain, isn't ideal with any sandal. And water sandals are no different. The lack of support will, over time, cause most people foot problems. Hiking a few miles in the city with a water sandal is fine. But taking off on a 15 mile hike with a medium weight backpack is a great way to insure a miserable trip. You Are Clumsy - Do you stub your toes on the couch, the curb, the car and your cat? Or do you like to drop things on your foot, items that range from the lightweight to the ungodly heavy? Well, if you do....then avoid a water sandal. Water sandals provide little to no protection to the front or top of the foot. While dropping a case of beer on your foot even when wearing a water shoe will hurt, it will hurt a hell of a lot more if you're wearing a sandal. Sometimes, pictures are worth a thousand words. So below are examples of a suitable water sandal that works well for active water sports uses and a "beach sandal" that work fine at the beach and around town - but are ill-suited for use as an active water sports sandal. Note the thick sole on the sandal. A true "Water Sandal" that works well for active water sports activities. And the aggressive, sticky tread pattern of a "good" water sandal. By contrast, here's a typical "beach sandal." This particular one is a Teva's Original sandal. It's a fine sandal for the beach, but note the thin sole and the wimpy tread pattern. Using these types of sandals on slick, rocky terrain is a wonderful way to see the inside of a small-town Montana hospital. Good sandal for the beach. But thin sole is bad for the rocks. And note the awful tread pattern. It works well for pavement and a sandy beach, but is terrible for rocky terrain. When shopping for a water sandal, any buyer needs to pay particular attention to several things in order to avoid buying a "normal sandal" that works fine for the beach or the office but poses big problems for a Montana river. Check the Sole - The sole of the sandal (or the bottom) should be thick and have an aggressive tread pattern. Vibram soles, which are generally used in hiking shoes, are generally used on quality water sandals, too. Thus, if you see a sandal with a Vibram sole, then the sandal likely provides excellent traction on slick surfaces. Quality Matters - Poor quality = quick death of a sandal. The reason for this is simple, too. The constant immersion in water quickly tears apart a poorly made sandal. In particular, I've discovered that the stitching on low quality sandals quickly falls apart. Say No to Flip Flops - Flip flops are fine for the local beach or the backyard. But for any sort of use around a rocky river, they are worse than useless. For walking in and around a river, it is very important that the entire sandal keep contact with the foot (for stability). Having the rear of the sandal "flip flop" around as a person walks is a recipe for unpleasant events happening while walking in a rocky river with swift flows. What's It Made From? - A true water sandal is made of various synthetic materials, with nylon being quite popular. Anyone shopping for a water sandal for water sports activities should avoid anything made from leather. The reason is because, over time, leather will break down when continuously submerged in water. If in doubt...go with Teva's - My Teva's have survived the test of time and have worked perfectly for my forays on land and on the water. 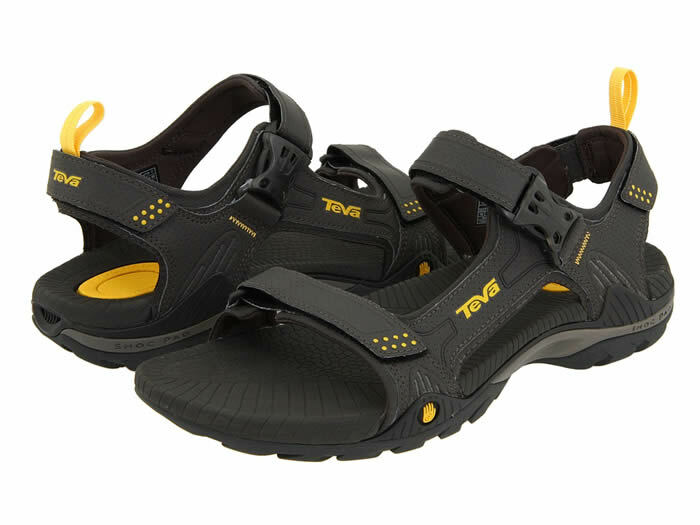 While other good styles of water sandals are made, you can't really go wrong with the styles of Teva's that have aggressive, sticky tread patterns and are designed for rugged use in the water. Get a Water Sandal...Not a Beach Sandal - Regardless of what brand of sandal a person gets, if you plan to use the sandal in a rocky river or a stream with swift flows, it is imperative to get a "water sandal" and not a "beach sandal." Beach sandals work fine for the beach, but lack the tread and sole needed for active water sports uses. Or perhaps I should put it another way....where to buy good quality water sandals that work well for use in rocky rivers and rivers with swift flows. Offline, many good sporting stores - such as REI and Cabela's - carry Teva water sandals. Just be sure to get a sandal that is designed for active water sports uses. Teva has a dizzying variety of styles available, and not all are designed for active water sports activities in rocky, slippery terrain. In other words, try to avoid the "beach sandals" and look instead towards the true "water sports sandal." Online, Teva's are sold everywhere. But again, just be sure to get a "water sports" sandal and not a beach one - at least if you plan to wear the sandal in rocky or swift flowing rivers. Zappos - Usually has the full selection of all Teva styles in stock. Amazon - Sells the full collection of Teva's as well. Popular sizes can be difficult at times to find, however.